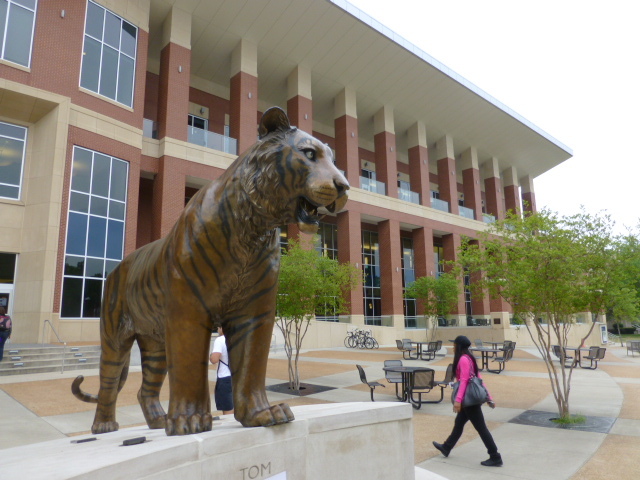 One of the many tigers statues from campus placed prominently in front of the new Union. For a medium-sized, urban, public school, this was surprisingly attractive (and safe! 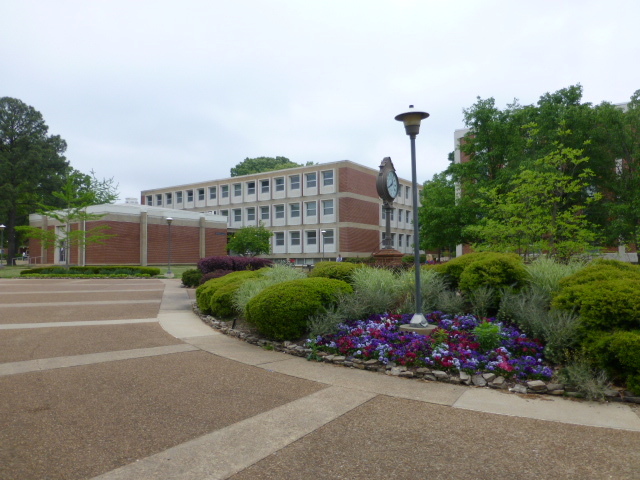 They’re ranked as the #1 safest metro school in TN [they’re proud that they beat Vandy] and Campus Security patrols campus and a two-block radius around campus, which is where much of the off-campus housing is). The campus is designated as a Level-2 Arboretum with more than 60 types of trees, and there’s lots of open space on campus. Prominent in the middle of campus is the impressive new 3-story union which opened in 2010. 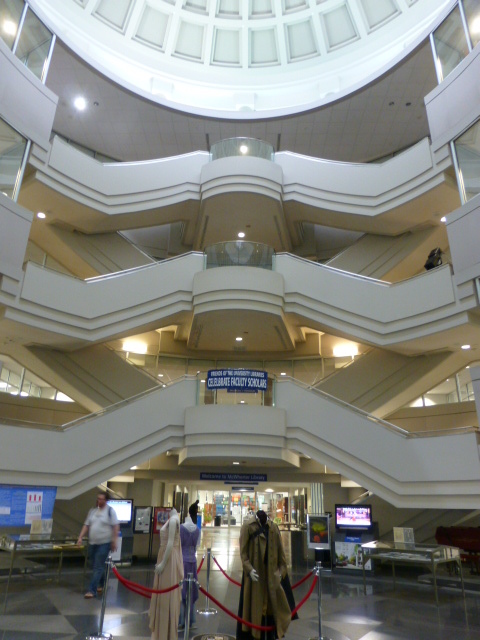 The middle is open with grand staircases all the way up to the top floor, and much of the social life goes on there. Not only are there various offices, but they have several food options, both to-go (such as Dunkin Donuts) and their own sit-down restaurant fashioned like a Chili’s that’s open for lunch (the nachos are a big thing there). There’s a full-sized theater on the second floor that shows recent movies and gives out free popcorn and soda. The Post Office is here – something that surprised me (and I’ve never seen on another campus) is that students have to rent a PO Box if they want one, even if they’re residential students! Currently, only 3000 of the 16000 undergrads live on campus. The university is trying to get more residential students as well as deal with the “parking convenience” issue (there is parking, but it’s sometimes far away which the students say can be difficult and requires that they get to campus earlier to give them time to park and walk to class). They’ve recently built Honors Dorms which are fabulous! The rooms are traditional doubles, but the bathrooms, although located in the hall, are private (you can close and lock the doors); each bathroom is a complete unit (sink, toilet, shower). In the rooms, the “dressers” are two stackable components of two drawers each that can either be separated and go under the bed or stacked to be a more traditional dresser. 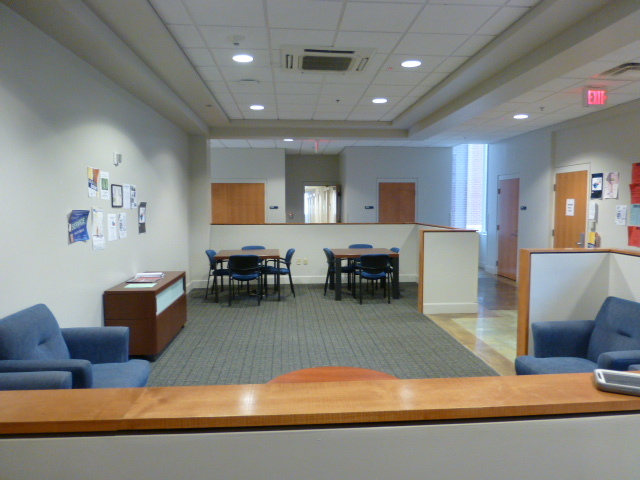 The halls are set up in circles, and there are kitchens and lounges on each floor. It’s a clean, comfortable set-up. I asked the tour guides about diversity on campus; it’s clear from just walking around campus that there’s a lot of racial diversity that reflects the nature of Memphis, but they said that there’s a lot of political and religious diversity as well. They have “Religion Row” which houses buildings dedicated to all sorts of different religions, so everyone has a home. I also asked them what sort of student tends to fit in and which tend to leave. Neither one of the guides knew more than a couple people who have left; they said that the students who don’t fit in tend to be close-minded or they don’t like the city. They also agreed that students who transfer tend to go to smaller schools. They have carts that they use to take people on part of the tour. This was fun, but not entirely necessary since the campus isn’t that big. However, despite that fact, they do run shuttles around campus fairly continuously – but this seems to be a response more to the commuter population and people needing to park farther away sometimes. There’s even an app that tells student where each shuttle is, which the students find particularly useful in bad weather. They have quite a few majors and academic programs to brag about. They’re #1 in the state for nursing, and their other med programs such as Pre-Dental and Pre-Med are also strong; Memphis has a lot of hospitals (many of which are close to the university) which provides a vast range of clinical experiences for students, so they graduate with a lot of different types of hands-on experience rather than just 1 or 2. Their Business program is solid (and they have particularly strong links to FedEx so students do a lot of internships with them, as well). There’s a music conservatory which requires an audition for admittance. Psychology is their most popular major and gets the most funding (and the psych lecture hall is the biggest on campus with 450 seats, although most classes cap at 300 with break-out sessions). The ROTC program is large, and they’ve just started an Asian Studies Program, as well. As a college, they’re ranked #7 in the country for internship experience (as defined as participation as part of a credit-baring course), and their job-placement rate is high because so many of their students graduate with real-life, practical experience. To be considered for admission, they use the following formula: (GPA x 30) + ACT score. If the student has a 95, the rest of the application will be looked at. The only time they will look at letters is if they’re denied and people feel that the application needs to be reviewed. They don’t superscore either the SAT or the ACT, and applicants need at least a subscore of 16 in English on the ACT. There are several scholarships available, and Non-Resident scholarships are stackable with the other scholarships which are dependent on GPA and ACT scores (23 ACT and a 3.0 gets you $8000 a year; 25ACT and a 3.25 = $11,000; 30ACT and 3.25 = $13,000). Two of their scholarships need separate applications and the deadline is moving up next year, probably to 12/1. The TOEFL is required of all international students, even those graduating from a US high school. 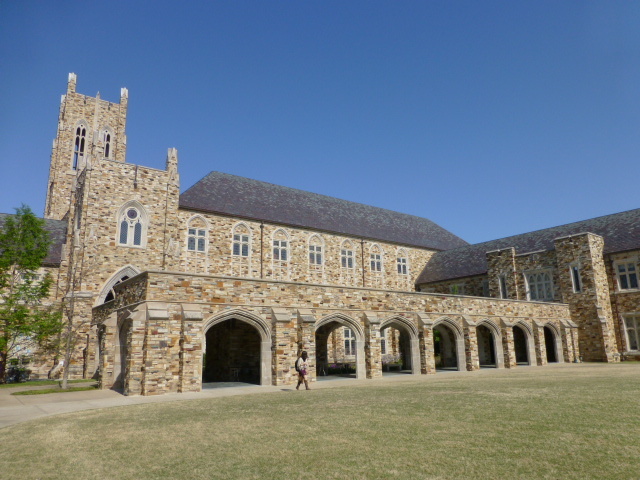 I was impressed with Rhodes; it lived up to all the things I’ve come to expect from a Colleges That Change Lives school. 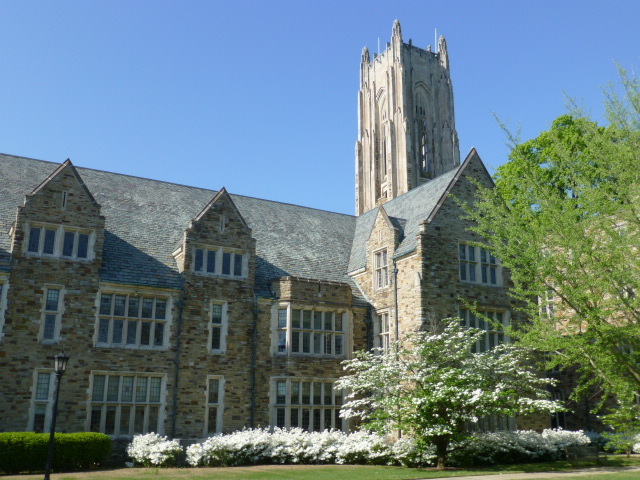 Not only is it a beautiful campus (it falls into the small group of colleges, along with places like Bryn Mawr and WashU, with lots of gothic stone buildings), but they’re also rightfully proud of their “focus on the 4-Rs: Rigorous academics in the Real world on a Residential campus showing proven Results,” as one of the admissions rep puts it. They boast a high retention rate and an impressive 91-100% acceptance rate to grad school over the last 10 years, so they’re doing something right. The admissions rep gave a very enthusiastic, quick overview of the school before splitting up the group among the 3 tour guides: “It’s their job to show you their home.” There were four college counselors touring Rhodes on the day I went, so they sent us out with our own guide. Rob was a fantastic, dynamic senior from Texas majoring in International Urban Politics; he said that we’ve probably never heard of it before since “I made it up.” Before leaving the office, one of the tour guides put a large map up to show us where we would be going. This was a great idea and helped us get a sense of campus; I don’t know why more schools don’t do this. The Star Room in the library. Much of the campus has a wooded feel; I drove up to the admissions office under a canopy of trees, so I wasn’t surprised to learn that the campus is a federal arboretum. 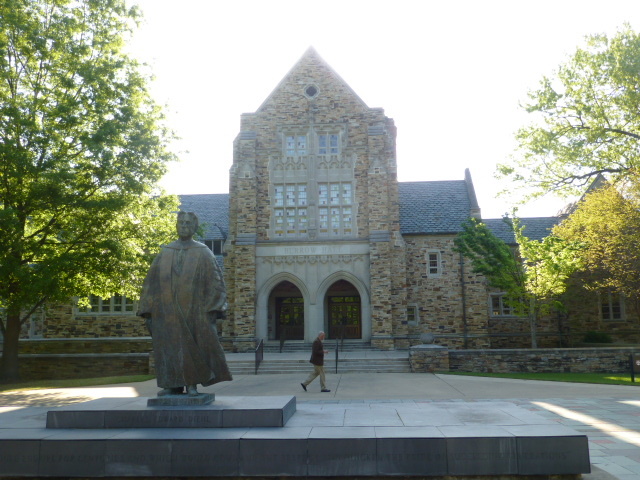 When Rhodes built the new library, they had to cut down a few trees, but they incorporated the lumber into the building. Their library is now ranked among the top 25 most beautiful libraries in the world, and is one of two earthquake-proof buildings in the state, designed to “split in half.” On the first floor is “Middle Ground,” the 24 hour section of the library. Rob told us that it’s “where people go to pretend to study. You hear all sorts of typing, but people are really on facebook.” The rest of the library is where the real work gets done, and the floors get progressively quieter on the higher levels. 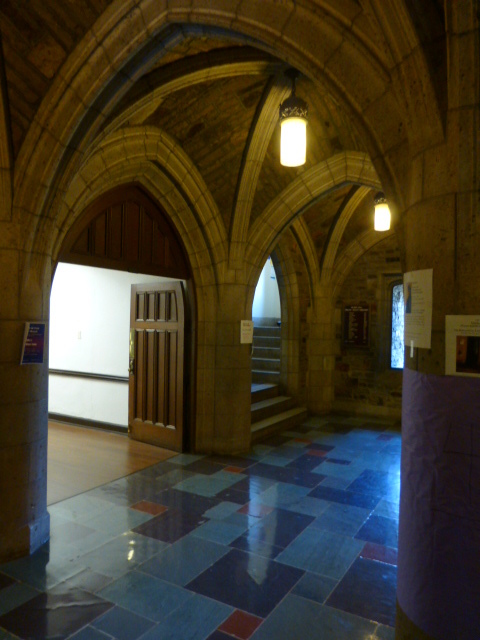 The Star Room on the second floor was co-designed by the art students and the astronomy students. The ceiling has as astrological chart of the way the school looked on the night the university opened. About three-quarters of the students live on campus all four years. The freshman dorm we toured was great! It even smelled good. Rob had sent pictures to his friends back home who were at the state flagship university, and they were definitely jealous, comparing his large suite with stained-glass to their little cinder-block rooms. They just finished building a Junior dorm that acts as a “bridge” between the freshman and sophomore dorms and the Senior apartments (which have 6-8 rooms connected with 2 bathrooms and a common room). 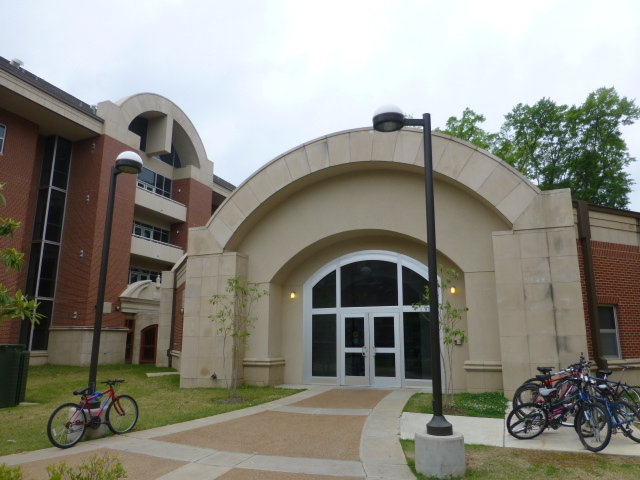 The junior dorm is a little more independent, has some kitchen options, etc. For students who want to move off campus, it’s easy to find housing. Rob rents a house from a prof with six other students. There are also housing options listed online in the Marketplace section of the website. 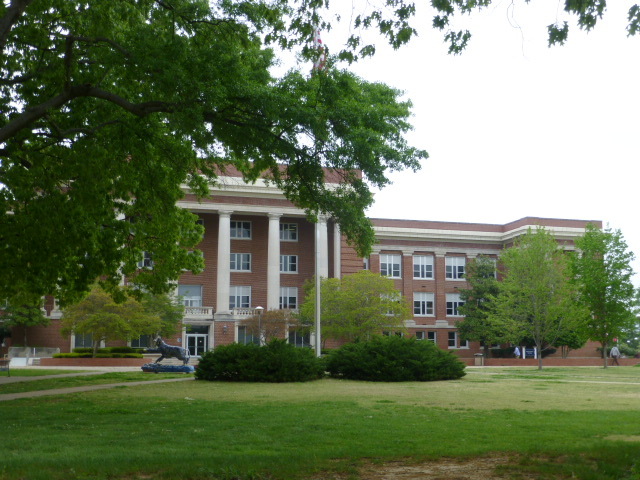 There are no Greek residences, even though about 50% of students get involved in Greek life. The groups are inclusive with most activities open to anyone. Rush happens during the second week of classes. Rhodes has a completely student-run Honor Code (1 of only 17 in the country). If there are violations, students get called in front of the council which deals with the entire investigation. Students could get expelled, but he doesn’t know if that actually has happened since everything that happens is confidential. In the presentation at the beginning of the morning, the admissions officer told us that the average class size is 14, so we asked Rob what the reality of that was. He is currently in an individual study (so a class of 1) but of the regularly scheduled classes he’s taken, the smallest has been 3 (he’s had several classes with fewer than 10 students); his largest has been in the high 20s. He said that people here who succeed are engaged in class; students can’t get away with NOT be engaged in a school this size. “We’re all big fish in a small pond.” He knew two people who transferred: one wanted a specialized medical field not offered at Rhodes, and one was disillusioned by the size; his parents had pushed him to Rhodes when he was choosing between Rhodes and LSU. He likes that the students can utilize the resources of Memphis for internships and for research as part of classes. 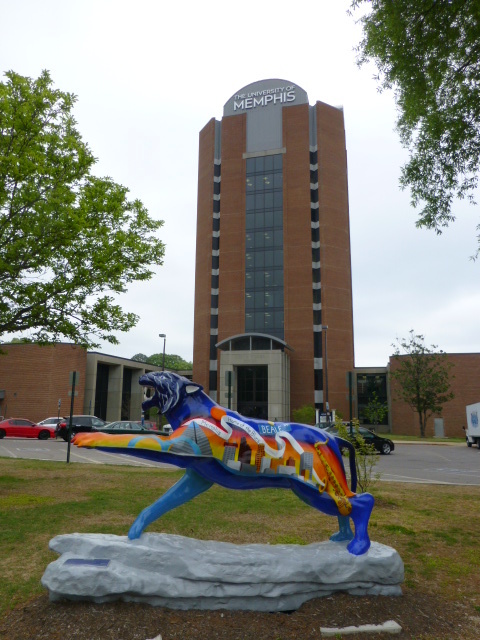 There are nine Fortune-500 companies in the area including FedEx, Auto Zone, and International Paper. 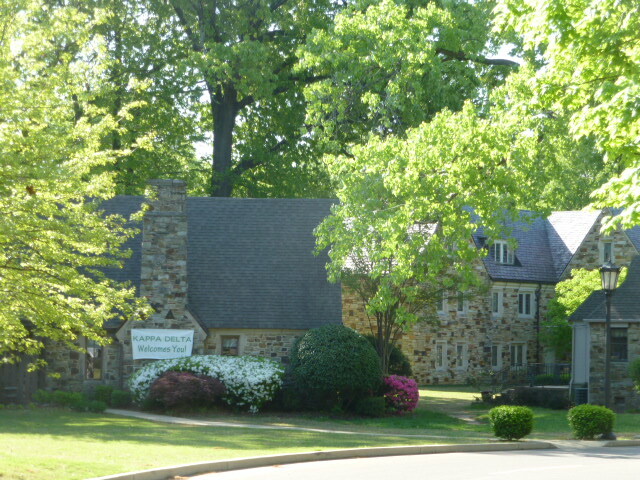 St. Jude’s Research Hospital is nearby, and Rhodes is the only undergrad institution allowed to send students to work there.